What a pleasure it was to work with this very sweet bride and wonderful family. Also we are grateful to Staske Photography for allowing us to show you these beautiful photographs. 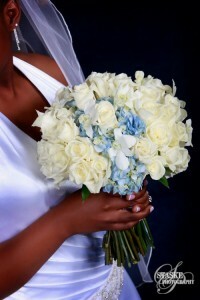 Jacquelyn’s bouquet was primarily white roses, however the hydrangea peaks through adding a soft blue backdrop to the whites of the bouquet. 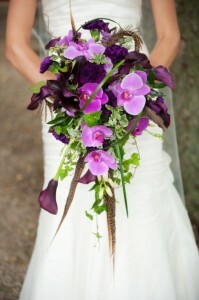 White dendrobium orchid blooms contributed to the sophistication and texture of this bridal bouquet. 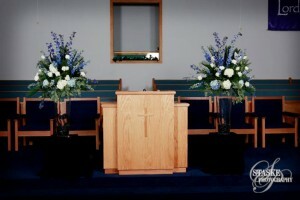 Two large sprays dressed the front of the church and brought all attention to the altar. 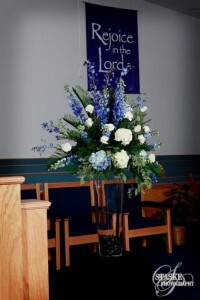 The shades of blue in these arrangements brought together the soft blues carried by the wedding party and the medium and dark blues of the church. Thanks to wonderful photographer Mark Romine ( check out more of his pictures at www.romineweddings.com) I have gorgeous new pictures of wedding flowers we designed for Ruthie’s September 5th Wedding. A twist on the traditional cascade, this tear drop shape was formal but chic capitalizing on flowers, feathers, and foliage. 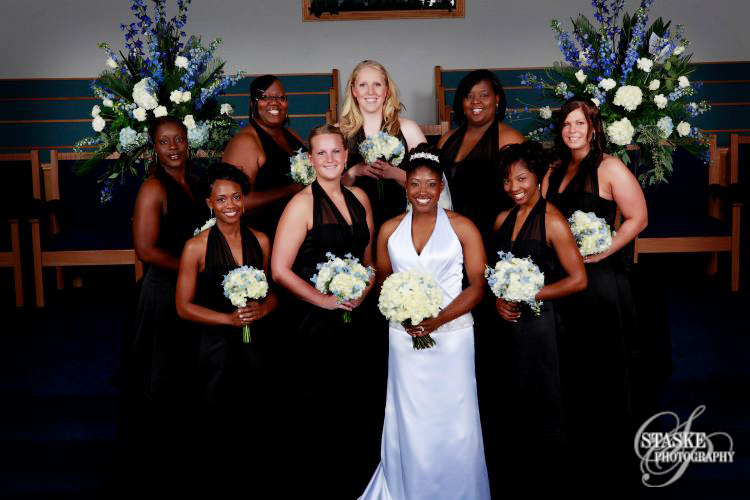 Plum Mini Callas coordinated perfectly in style and color with Ruthie’s choice in bridesmaid dresses. The hot lavender Phalaenopsis orchids brighten up the bouquets carried by all the women, while the MoonVista dianthus added texture and a mid-tone purple. This cake was baked and designed by The Cake Artist Studio in Champaign. 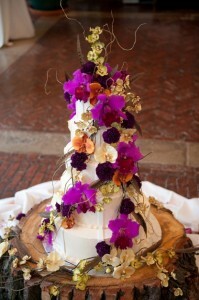 Many of the flowers used to dress the cake were artificial, with the exception of the hot lavender Japhet Orchid blooms and the purple MoonVista Dianthus. Thanks again to Mark Romine for sharing his beautiful images of a stunning wedding. 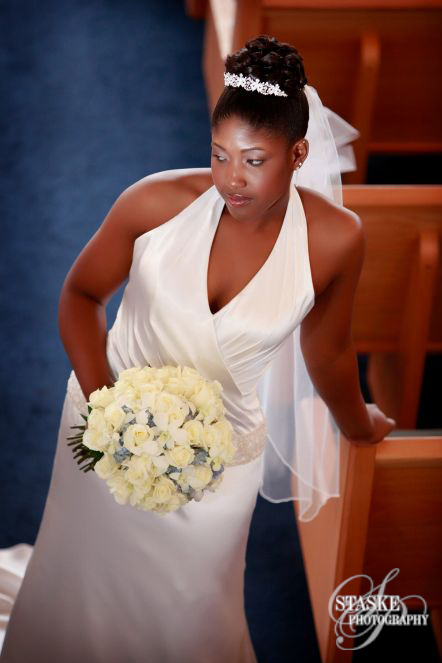 Ruthie you were truly a stunning bride thank you for the privilege of helping you make your wedding dreams a reality.